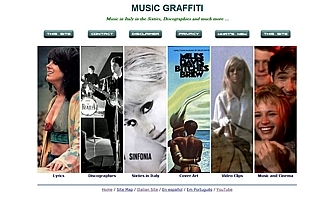 Since many years it's online an English version of this website, called Music-Graffiti. In this website you can find many information originally available in Italian, as lyrics organized by album for our preferred musicians, discographies, soundtracks of films in which the importance of the music is prominent. Specifically created or adapted for the English website is the sections dedicated to the Italian music in the sixties, with in evidence the "covers" phenomenon, i.e. the Italian version of foreigner songs, often more famous in Italy than in the original country (almost always US or UK). It's included also a little section for some important (and beautiful) Italian songs, almost completely unknown outside Italy, presented and translated in English. Other sections with much more information in the English website than in the Italian one are those dedicated to album cover art and video clips, in which are included many full size images previously not available in the web, reproduced directly from the original videos or albums. Musica & Memoria / Music-Graffiti / For further observations or questions please write to the webmaster.